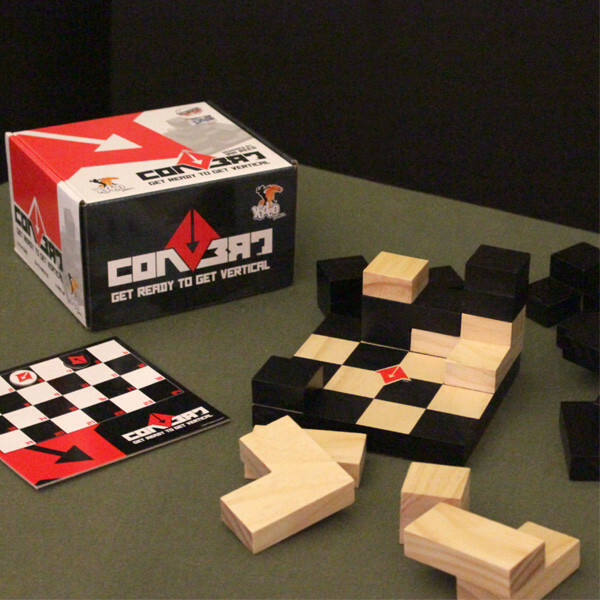 CONVERT is a two player abstract strategy board game. 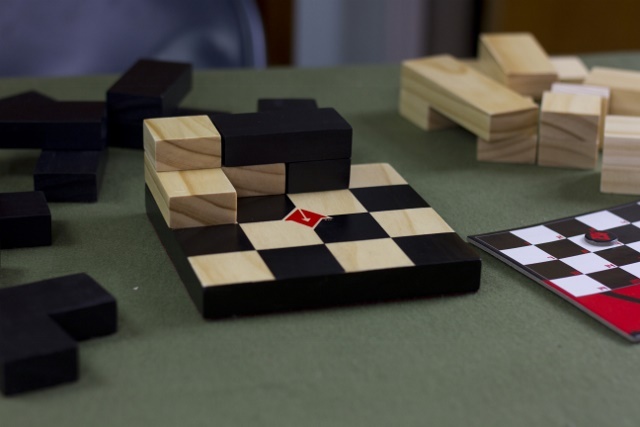 Two opposing players each have a set of 10 differently shaped wooden pieces that are played on a 4 x 4 board with alternating black and white squares. A seemingly simple puzzle game, Convert pushes spacial awareness to the next level. By manipulating pieces to fit with each other, players attempt to score rows, while claiming spaces on the board by converting them to their color. Unlike many other abstract games that leave all of the scoring to the end, Convert creates a dimension of play that challenges players to battle for points throughout the entire game. First, players collect points as they create each row of four squares, and finally, this score is added to the amount of squares they occupy as seen from above. This isn't as easy at it looks though, as each piece you place causes the board to climb taller, making pieces more difficult to play! We have yet to see a game of Convert be played where the players haven't literally become "vertical" themselves and stand up to get a better look! Small heavy box 1.4 kg. Brascogames is a worldwide shipping specialist.